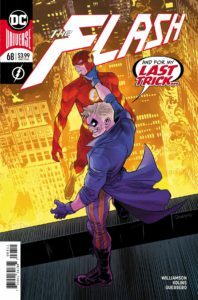 When we left last issue, Barry was facing down what seemed like the entire CCPD – all of them under the spell of the Trickster. At Iron Heights, James Jesse has everyone under his control, including the rest of the Rogues…and more famous bad guys as well (check out that double page spread for more). As Barry and a group of other “not yet happy” people are brought in, they go through the “Happy Machine”, something energized by the Sage Force itself! Yes, James Jesse has managed to garner part of the Sage Force, and it has allowed him complete control over the citizens of Central City. Barry goes along but manages to avoid the effects of the “Happy Machine”. When he returns as the Flash, things don’t go so well. He first has to face the second Trickster, who is also under James Jesse’s control. Then, as he confronts the original Trickster, he sees how this “happiness” has taken a more violent turn for the people of Central City. They are literally trying to kill each other! I loved reading about the Rogues as a kid in the 1960s…but I never saw the Trickster be this powerful an enemy to the Flash. This version of James Jesse is chillingly effective, brutal in his vision and seemingly unbeatable, at least for now. This Trickster gives me the creeps…and that’s a good thing for this arc. There are some elements of this story that have been brewing for quite a while, and we are finally reading the payoff in what is already a spectacular arc by Joshua Williamson. James Jesse has been waiting a long time for his revenge, and the way that this has come together blends several recent arcs perfectly. Makes me want to go and read a few back issues in a new light. There are a lot of great panels in this issue, thanks to the art team of Scott Kolins (pencils/inks) and Luis Guerrero (colors). There was a great balance between action and emotion throughout the issue. Still, one of my favorite panels came late in the issue, when Trickster woke up Barry after he had been knocked unconscious. The silliness of the panel – and the hilarious expression – was a perfect counter to the seriousness of so much of this story. SUMMARY: This arc is already becoming a classic – don’t miss it! I’ll give this issue a 10/10 – of course, that’s just my opinion. What do YOU think? Leave your comments below!